For many, the first time they became aware of Alison Krauss was the release of her remarkable duet album with Robert Plant, Raising Sand, which was released in 2007. Numerous listeners who heard her in this setting, then had the joy of going back and discovering the work of the talented artist who has done more to popularise bluegrass music in the modern day than any other. More than that, those in the know understood just how well-known a secret she was. Working solo, or with her group, Union Station, she had won an unbelievable 27 Grammy Awards from 41 nominations, making her, alongside Quincy Jones, joint second only to the venerated Sir Georg Solti, who amassed 31 awards in his lifetime. Alison Krauss was born in Decatur, Illinois on 23 July 1971 and grew up in nearby Champaign. She began learning the violin at the age of five, at the request of her mother who wanted her daughter to "find interesting things to do." She started in classical music and quickly moved to bluegrass, and by the age of 10 she was already sitting in on country bands. By the age of 13, she had won the award for Most Promising Country Fiddle Player (Midwest) from the Society for the Preservation of Bluegrass Music. Her first release came in 1985 with the instrumental album of traditional music, alongside her brother Viktor, Different Strokes, on the independent label, Riddle Tunes. Around this time she played fiddler in John Pennell's band Silver Rail, who, finding there was another group with the same name, changed theirs to Union Station. Even though the line-up was to change considerably throughout the years, Union Station remains Krauss' band and they have played together throughout. Pennell wrote a great deal of her early material for her. Krauss signed with Burlington, Massachusetts-based roots-focused Rounder Records in 1985 at the age of 15 and has, remarkably, remained with the same label ever since, despite many offers to lure her to somewhere bigger when she broke through at the start of the 2000s. Her contract stipulated that her release should alternate between solo albums and Union Station albums. 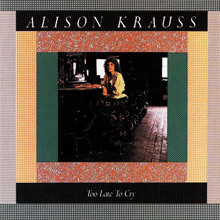 Her first solo release on Rounder was Too Late To Cry, in 1987, which featured Union Station, then comprising banjoist Alison Brown, Krauss' brother Viktor on bass and guitarist Jeff White. The first release credited to Krauss and the group was Two Highways, in 1989, which was Grammy Award nominated for Best Bluegrass Recording. It demonstrated a willingness to uphold the bluegrass tradition, while experimenting with songs from outside of the genre. Krauss's next album, I've Got That Old Feeling, in 1991, was a huge hit and did, indeed, win the Grammy Award for Best Bluegrass Recording. It crossed over into the national charts. Subtle moves towards the mainstream occurred – she recorded a promo video for the single of Louisa Branscomb's poignant 'Silver Rails'. By now, Krauss was producing and arranging most of her own work. 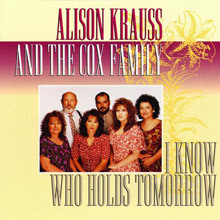 The AKUS album, Every Time You Say Goodbye, in 1992, was a typically assured collection, while I Know Who Holds Tomorrow, in 1994, was recorded with the Louisiana-based bluegrass specialists, the Cox Family. Its modern take on gospel songs proved popular, reaching No. 32 on the Billboard Contemporary Christian chart. However, it was the 1995 compilation, Now That I've Found You: A Collection, which propelled Krauss into the mainstream. It contained just enough hooks to get the non-traditional listener entranced – a beautiful version of Paul McCartney's 'white album' ballad, 'I Will', but most striking was its title track, a cover of the Foundations' 1967 hit, delivered sweetly and openly. The single of 'Now That I've Found You' went to No. 3 on the Billboard Country singles chart and into the Hot 100; the album went to No. 2 in the Country charts and No. 13 in the Billboard 200. Suddenly, Krauss had arrived, the album sold over a million copies and another track from it, the tender version of 'When You Say Nothing At All', originally recorded for a Keith Whitley tribute album, became an enormous radio hit. In the UK, Radio 2 began to pick up on her beautiful, plaintive vocal style. So Long So Wrong was the first new album from Krauss and Union Station since her upswing in popularity, in 1997. It went to No. 4 in the Country charts, and won three Grammys. At 26, Krauss had become one of the most respected performers in the US, just 10 years after her first contract with Rounder. Forget About It in 1999 was a return to solo work, tender and mellow in equal measure. It contained a sweetly affecting cover of Todd Rundgren's 'It Wouldn't Have Made Any Difference'. Mojo said in their review at the time, "Usually, bare opening bars have just an acoustic guitar and Krauss singing. She seems to murmur, though she is perfectly clear. Turn it up to 11 and you would still find yourself leaning in to meet her intimacy." At the age of 29, she became the youngest member of Nashville's Grand Ole Opry. It was her appearance on the hugely popular, multi-million-selling O Brother, Where Art Thou? soundtrack that further enhanced her popularity. On the back of the success of the film, AKUS album New Favorite was an instant hit on its release in August 2001. Her Live album the following year was a fine précis of her career to date. Lonely Runs Both Ways, released in November 2004, showed the outfit going from strength to strength, picking up three Grammys in the process, including Best Country Album. A Hundred Miles Or More: A Collection was released in April 2007. Released on 23 October 2007, Raising Sand, her duet album with Robert Plant, became an enormous runaway hit. Plant, a long-time admirer of her work, had wanted to record with her. If people were not aware of her work, they truly were now. A collection of personally-selected covers, it reached No. 2 on both the UK and the US charts, and went on to win Album of the Year at the Grammy Awards in 2009, while its stunning shimmering 'Please Read The Letter', a track that had previously been on Plant's collaboration with Jimmy Page, Walking Into Clarksdale, won Record of the Year. The Times said, "Krauss may have never sounded better than she does here; as for Plant, though, it doesn't make sense to say the same thing. On Raising Sand, he has quite simply found a whole new voice." The two worked so well together. 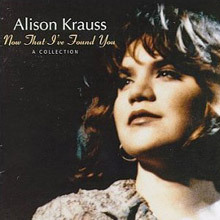 After the success of Raising Sand, The Essential Alison Krauss was released in July 2009, to send all her new listeners back through her 20 years of releases. With the line-up of Union Station now stabilised as Jerry Douglas (Dobro, lap steel, vocals), Dan Tyminski (guitar, mandolin, lead vocal), Ron Block (banjo, guitar) and Barry Bales (bass, vocals), with Krauss on lead vocal and fiddle, they released the accomplished Paper Airplane, which after such a distinguished career, was Krauss' first Country Music No. 1 album and a Billboard Top 3 success. Well respected in the UK, with followers the world over, Alison Krauss' reputation has grown, and has enjoyed sustained commercial crossover. Without 'Baby, Now That I've Found You', her contribution to O Brother, Where Art Thou? and Raising Sand she would have still been multi-award winning and respected within her genre. The success of those diverse projects has ensured that her star has kept twinkling. With such a wealth of catalogue, there is a great deal of the work of Alison Krauss to discover. Anyone who's paid attention to Alison Krauss' musical career, with and without Union Station, had to wonder what would happen after the unprecedented success of 2007's Raising Sand, her collaboration with Robert Plant. For her, the next logical move was to reunite with US, who had been dormant since 2004's Lonely Runs Both Ways and whose members all had busy solo careers. Given the long layoff, Paper Airplane was produced by US and engineered and mixed by Mike Shipley. According to Krauss, it was harder to complete than any previous album.Thankfully, it doesn't sound like it. It is a melancholy record, its songs largely revolve around themes of trial and perseverance. The title track that opens the record is a lilting country ballad written by Robert Lee Castleman and informed by Krauss' own recent life experiences. Her vocal is wrenching; it's utterly vulnerable in expressing love's loss, yet it's steely in its resolve, recognizing an eventual emergence. Peter Rowan's minor-key bluegrass stomper "Dust Bowl Children" features Dan Tyminski's trademark vocal. It's angry, bewildered, and determined. The interplay between Ron Block's banjo, Barry Bales' driving bassline, and Jerry Douglas' dobro is earthy, lean, and mean. Brother Viktor Krauss and Angel Snow contributed "Lie Awake," a spooky, broken love song full of swooping dobro and Krauss' forlorn fiddle. Only US could empathically back her searching, desperate vocal. Paper Airplane is sequenced beautifully. The reading of Richard Thompson's "Dimming of the Day" is the hinge piece on the record (and rivals the title track for the best thing here). This is Krauss' finest vocal performance this time out; although it doesn't rival Linda Thompson's original, it doesn't need to: it's devastating in expressing raw need, loss, and emptiness from a protagonist in the middle of a time of trial. Sidney Cox's "Bonita and Bill Butler" is a banjo-driven seafaring tragedy sung exquisitely by Tyminski before Paper Airplane closes with a stellar cover of Jackson Browne's "My Opening Farewell," which brings the album full circle, leaving the listener to meditate upon life's many episodes. Krauss' version wrings more sheer acceptance from the lyrics than Browne's own does. Paper Airplane is very polished -- pristine, even -- but there isn't an extra thing on it. It feels organic and authentic, allowing plenty of room for the emotional power in these songs to come forth. Union Station proves once more that it is a contemporary bluegrass outfit that makes no concession to contemporary country music. Alison Krauss was born to sing bluegrass. Her voice just wouldn't work in a riot grrrl or hip-hop setting. Not even close. The fiddle wouldn't quite fit either. Lucky thing she found her calling. On Every Time You Say Goodbye, Krauss is once again teamed with the stellar craftsmen of Union Station, and she sounds as comfortable as a porch swing and lemonade on a warm summer evening. Although Krauss gets the majority of the accolades, this is truly a group effort as the various musicians share the credit as writers and producers. Ron Block, Tim Stafford, Barry Bales, and Adam Steffey also take their turns stepping up to the mic, offering harmony and lead vocals where fitting. The songs range from traditional country fare to unexpected covers like Shawn Colvin's "I Don't Know Why." Their arrangement might seem oddly peppy to those who know the Colvin version. But to those who don't, it works just fine. Other highlights include the title track, "Who Can Blame You," "Last Love Letter," and the Karla Bonoff composition "Lose Again." And you just have to love a record that includes "Cluck Old Hen," which happens to be a fine showcase for Krauss' outstanding fiddle work. She has done a lot to make bluegrass a viable, contemporary genre of music. Every Time You Say Goodbye does much to further that cause. When I've Got That Old Feeling garnered Alison Krauss 1990's Best Bluegrass Recording Grammy, it was an acknowledgement of the talent and poise the former child prodigy had shown through her first three albums. The album's tantalizing blend of tasteful folk and traditional bluegrass certainly deserved the award. But Old Feeling was more important as a footbridge to where Krauss would take her music -- and bluegrass itself -- over the next decade. It blended country and bluegrass with pop elements (the latter being most evident on "Longest Highway") in such an effortless way, the album couldn't possibly be seen as a play for the mainstream. The sentiment behind the gentle sway of "It's Over" and "Wish I Still Had You" was universal; blended into the honeyed voice of Krauss, it was irresistible. At the same time, the playing on "Will You Be Leaving" and "Dark Skies" was not only technically skilled, but startlingly genuine. (Sam Bush's mandolin and the dobro leads of producer Jerry Douglas were particularly impressive.) The record was imbued with the same old feeling that Krauss and her Union Station guitarist Dan Tyminski would later draw upon for O Brother, Where Art Thou? -- it was a bluegrass album at heart, but it came from a place where emotion and honesty weren't labeled with a genre tag. I Know Who Holds Tomorrow isn't as consistently engaging as Every Time You Say Goodbye, but that's only a relative term -- from any other artists, this would be a masterpiece. From Alison Krauss, it's another reliably wonderful collection of jaw-dropping fiddling and breathtaking singing. 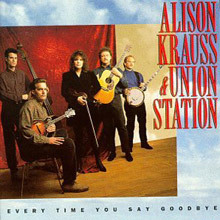 After mainstream success happened for Alison Krauss &amp; Union Station, one would have rightly expected a commercial sweetening of their sound, resulting in diminishing (or even abandoning) the simple but very unique thing that brought them into the public eye -- and eventual public acclaim -- in the first place. But the group's first new recording in the wake of the surprise success of Now That I've Found You: A Collection finds Alison Krauss &amp; Union Station happily keeping their eclectic focus firmly on the prize stretched before them with no silly attempts to court the hat-hunk-of-the-month or the boot-scoot-boogie crowd. Despite the media's singling out of Krauss as country's new bluegrass solo diva, Union Station (with Krauss as simply a featured member of it) remains very much a group, and that's the real refreshing news here. It is that collective spirit that remains the reoccurring theme and the resounding musical point being made here, and it is the solid anchor that roots this album into place from beginning to end. Krauss' expert evocative way with a ballad is on full display here, with "Deeper Than Crying" and "It Doesn't Matter" featuring her on violas, adding a new voice to Union Station's sound. But the lead vocals are passed around among Krauss, mandolinist Adam Steffey, guitarist Dan Tyminski, and banjoist Ron Block, while Krauss' fiddle work in a backup capacity is an integral part of the sound as well. All in all, this is a totally un-gimmicky album that flies in the face of what usually happens when mainstream success comes calling. And, as a result of that commitment to quality and musical focus, one that makes you want to play it again when it's all over. Alison Krauss may have recorded Too Late to Cry when she was only 14 years old, but her sound was already well developed and astonishingly accomplished. Throughout the album, she demonstrates a mastery of bluegrass, singing and playing with a distinctive grace. It's an impressive debut, but it would pale in comparison to the albums that followed. Two Highways is the first album Alison Krauss recorded with her excellent backing band, Union Station, and, appropriately, it demonstrates that she could lead a band through a number of bluegrass standards, as well as several more contemporary numbers. Of course, her instrumental solo continue to be the most impressive thing about her music on Two Highways, but her duets with guitarists Jeff White demonstrate that her vocals are beginning to come into their own. Given Alison Krauss' tremendous popularity and her status as the first female bluegrass singer to cross over into genuine pop marketability, and given the fact that her guitarist, Dan Tyminski, is the voice behind "Man of Constant Sorrow" (or at least the version that served as an idée fixe in the blockbuster movie O Brother, Where Art Thou? ), a live album was inevitable. That it should be a two-disc set can simply be chalked up to good luck. Unless you're a bluegrass purist, that is, looking for music that preserves the traditional Appalachian sounds of Ralph Stanley and Bill Monroe. Listeners of that mindset will be bitterly disappointed by the presence of modern singer/songwriter fare ("Lucky One," "Let Me Touch You for a While"), by the drums on "Oh, Atlanta," and, most of all, by those dreadful call-and-response vocals on the chorus of "Man of Constant Sorrow" (which, you can hear them sniff, Tyminski takes at about twice the appropriate speed). All of this would explain why bluegrass purists are no fun to be around and, one suspects, don't have very much fun in private either. The simple fact is that every time Krauss opens her mouth to sing, angels stop what they're doing and take notes. There may be no musical pleasure quite as pure and sweet as listening to Krauss sing "Baby, Now That I've Found You" or "When You Say Nothing at All." And when she starts in on the impossibly beautiful gospel tune "Down to the River to Pray," the effect is almost disturbingly moving. Which brings listeners to the problem with this album, which is the amount of time it spends on stuff other than Alison Krauss singing great songs. The instrumental bits, the Jerry Douglas showcases, and Tyminski's requisite rendition of "Man of Constant Sorrow" are all fine, but they end up feeling like filler. Still, this album can be solidly recommended to modern bluegrass fans in general and to Krauss' many fans in particular.